Η ιστορία έχει ως εξής: Ο νεαρός δημοσιογράφος Stephen Glass έγραφε για το γνωστό περιοδικό "The New Republic". Τα άρθρα του Glass, για αρκετό καιρό σημείωναν μεγάλη επιτυχία και ο δημοσιογράφος έφτασε να γράφει για τα μεγαλύτερα αμερικάνικα περιοδικά (Harper’s, Rolling Stone, George κλπ). Κάποια στιγμή, αποδείχτηκε ότι τα κείμενά του ήταν λιγότερο ή περισσότερο κατασκευασμένα, δηλαδή προϊόντα φαντασίας κι όχι αποτελέσματα δημοσιογραφικής δουλειάς. Τότε, η συντακτική ομάδα του “The New Republic” δημοσίευσε το παρακάτω ως ένα είδους συγνώμης στους αναγνώστες του. The New Republic has always been a stringent magazine--stringent about intellectual honesty and stringent about telling the truth. We have not hesitated to hold others to account when they have, in our judgment, transgressed against those norms. But we know that this stringency--which is such an integral part of this institution's 84-year tradition--cannot be credible unless we are willing to apply it to ourselves when appropriate. 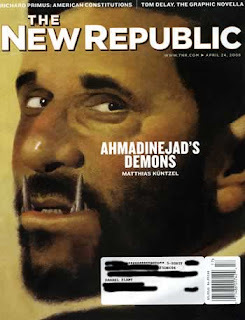 We must be stringent with ourselves because, from the issue dated December 25, 1995, to the issue dated May 18, 1998, and under three different editors, Andrew Sullivan, Michael Kelly, and Charles Lane (the present editor), The New Republic has published 41 articles by Stephen Glass. We hereby retract that story and apologize for publishing it. Stephen Glass has been dismissed from his position as associate editor. Even one such violation of our standards is too many. Regrettably, a preliminary investigation of Glass's previous work suggests that there may be others. Based on those inquiries, we now believe that two other articles that have appeared recently in our pages cannot be substantiated. They are: "Monica Sells," Glass's account of a purported convention of political novelty vendors in Rockville, Maryland (April 13, 1998), and "Plotters," Glass's account of a purported meeting of anti-Clinton activists in Virginia (February 23, 1998). Additionally, we believe that Glass manufactured the opening anecdotes of the article "Praised Be Greenspan" (March 30, 1998), concerning activities at purported investment houses in New York. We would like to offer our apologies for publishing this material as well. Rechecking Glass's stories is a laborious process. But be assured that we will continue to investigate all of the writing Glass did for this magazine. How could this happen? It is a perfectly fair question. We have been asked it repeatedly since we informed the press of Glass's firing, and we expect to be confronted with it again and again. We are asking it of ourselves. The editors of The New Republic, like those of other magazines, have devised fact-checking procedures to insure the accuracy of our copy. Generally, we believe our record in this regard has been a good one. Plainly, however, the precautions we took were not adequate to prevent Glass's fabrications from making it into print. We intend to find out why and to take corrective action where necessary. We editors take responsibility for the failures of discernment that permitted this false material to be published. But it is important to understand that our editing and fact-checking systems are designed to defend against the errors and mistakes even good professionals sometimes make--not against the systematic and intentional deceptions of someone who actually has no business practicing journalism. We assumed that no person who calls himself a journalist, least of all a member of our own family, would attempt to work with us on any other basis. In Stephen Glass's case, this assumption was not warranted. For reasons known only to him, Glass mounted what appears to have been quite an elaborate effort, including the falsification of documents and reporter's notes, to trick our editors and elude our fact-checkers. Looking to the future, our commitment to you, our readers, is to do whatever is necessary to restore any of your trust in us that may have been lost as a result of this extraordinary situation. We are not proud of the fact that Glass's falsehoods ever made it into our pages in the first place. But, once we had a reasonable basis to suspect that such falsehoods might have been published, we immediately investigated. Once we established the facts, we promptly removed the culprit, and we publicly acknowledged the problem. The New Republic's stringent tradition demanded nothing less. Αναρτήθηκε από spap στις 12:12 π.μ.